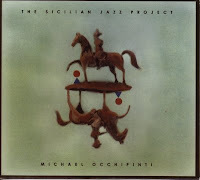 I've been spending unusually long periods of time in my car recently and my most frequent musical companion has been the new recording by Toronto guitarist/bandleader Michael Occhipinti. Occhipinti has had a series of intriguing projects – some shared with keyboardist Paul Neufeld, his co-leader in NOJO – which has found him working alongside musicians like Sam Rivers and Don Byron, and interpreting the music of Bruce Cockburn. This new project takes him – and his brother, the multi-faceted bassist Roberto Occhipinti – back to his Sicilian roots. Featuring players like trumpeter Kevin Turcotte, drummer Barry Romberg and saxophonist Ernie Tollar, the Sicilian Jazz project makes great driving music because it's filled with propulsive, joyous rhythms and passionate solos. It's also filled with terrific vocal performances by Maryem Tollar and Dominic Mancuso – who has a great, raw voice. I caught a version of this band this summer and they were a hell of a lot of fun, but blasting out of my car speakers on these cool, early-fall nights... hard to keep your foot off the floor. A recent liner note assignment from Italian pianist Roberto Magris (requisite plug: his new recording, Kansas City Outbound – the final recording by the great bassist Art Davis – will be out on Soul Note this fall) brought me in contact with the ghost of Hassan Ibn Ali. It's fascinating – and somehow reassuring – that in this age of Wikipedia, Google, etc., to learn that there are still some mysterious figures out there. It takes me back to my teenaged obsession with bluesman Robert Johnson, sparked by the ghost-story liner notes on the original Columbia Records reissue of Johnson's music in the '60s. Born William Langford, Hassan became a ubiquitous figure on the Philadelphia jazz scene in the '50s and '60s. He gets passing mention in Lewis Porter's biography of John Coltrane and Francis Davis' Outcats. Francis kindly helped me find out a bit more about Hassan, as did another Jazz Journalists Association buddy, David Adler. The search also brought me back in touch with one of the first musical connections I made on the web: pianist Marc Sabatella. Even with their insights, though, Hassan remains more a specter than flesh and blood. We know, of course, that the pianist was picked by Max Roach to fill out a trio with himself and Art Davis for a recording in 1964, but much else is speculation. Apparently, Hassan was an early influence on Coltrane – pushing him toward further exploration of certain types of chord voicings. Unfortunately, it also seems that the pianist had some mental issues that may have limited his own career – or did he? Much remains to be discovered. Fascinating. This morning's email brought surprising news about the demise of the Portland Jazz Festival. The festival topped a great five-year run last February with tributes to Ornette Coleman and Cecil Taylor, and was scheduled to mark Blue Note Records' anniversary in 2009. Coming on the heels of the bankruptcy of IAJE – and the cancellation of the planned convention in Seattle – it's quite a double blow to jazz in the U.S. northwest.